My Green Glowing birthday party in Milan: Alice in wonderland! When I was contacted by Alice’s parents, I immediately understood that we were going to be planning a luxury birthday party in Italy that was far beyond normal. Hosting your 18th birthday party in Milan is usually something special, but here I was facing a top-notch event which was going to be like no other event I had ever planned. To be able to tailor this important luxury event to the expectations of the family, I had several meetings with them. I was especially keen on getting to know Alice, to discover her personality, her interests, passions and taste. This is in fact how I discovered that this amazing girl is passionate about drawing and that she enjoys drawing by free-hand while listening to the professors in art school or while she is on the phone. The idea was immediate: Take one of those designs that she adores making and transform it into the theme for the party. This is how the patterns for the pillows, the cake and the plexiglass cubes were born. White and black were added to the color scheme, and together with the neon green these colors repeat in each and every detail of the design, including the food and beverages! 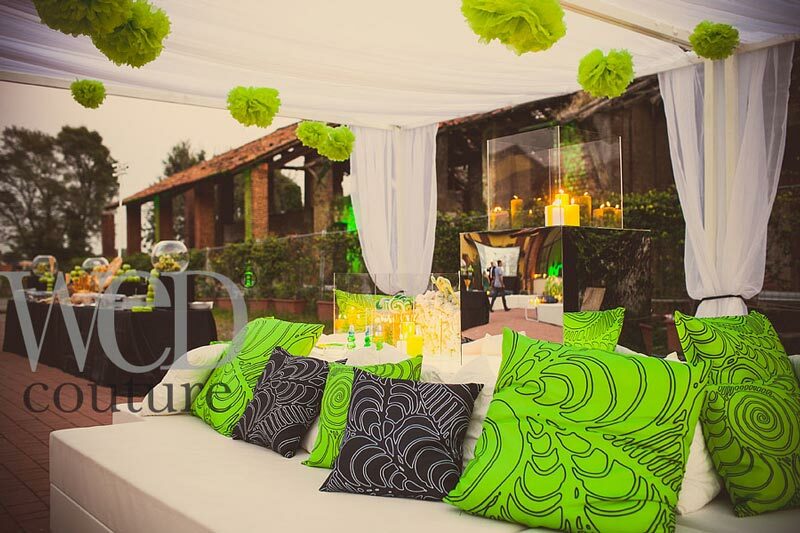 Designing luxury events in Italy we are used to creating wonderful solutions for our clients. The options that Alice and her parents settled for as regarding the entertainment were anything any guest could ever have dreamt of, one of the most exclusive parties in Italy planned by Italian weddings & events. – just to mention a couple of the choices made by the family: A famous DJ from one of the most hip discos in Milan brought in for the dancing, a photo booth with various props always available for photo fun, a unique guest book where the guests’ signatures and dedications become light grafitti on the venue walls, a huge candy buffet with any green candy you could ever think of, neon cocktails and lots of green and silver confettis during the cake cutting, and last, but not least, the top attractions of the evening: The various wearable items (necklaces, headbands, earrings, glasses and bracelets) in glowing neon colors and the “crazy hour” right after the cake cutting in which two people wearing white overalls distributed neon glasses and fill them from a kind of pesticide sprayer. This particular detail was highly appreciated by the guests who really had a good time getting “alcohol sprays” in their neon green glowing glasses. 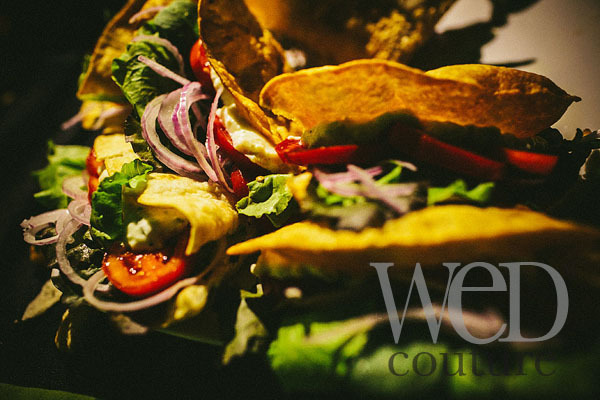 Served directly from the waiters’ trays trendy finger food in plexiglass containers and later during the dancing ice lollies made from fresh fruit. And everything, including the various decors ranging from the candles over the spheres illuminating the dance floor to the fabrics for the pillows, was produced to the family’s directives and design. Luxury at its best. 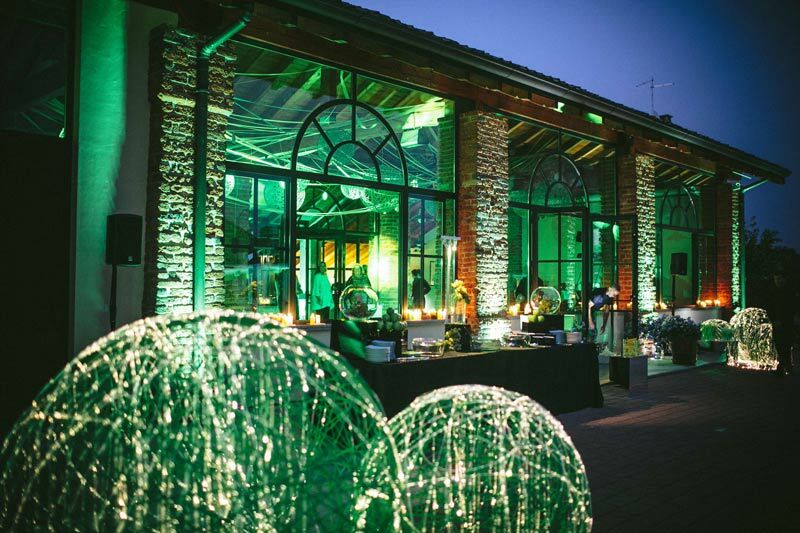 The event was host in a rustic but contemporary “Cascina”, just outside Milan – The antico Borgo in città , this venue has kept the ancient structure in the beautiful surroundings of the Forlanini park and is a typical village of 500 which survived from the expansion of the city. The guests had the feeling of being in the countryside of Milan.The particular closeness to the Airport allows to party til very late in the night! I’m proud to say that Alice and her parents were extremely happy with how the party turned out. 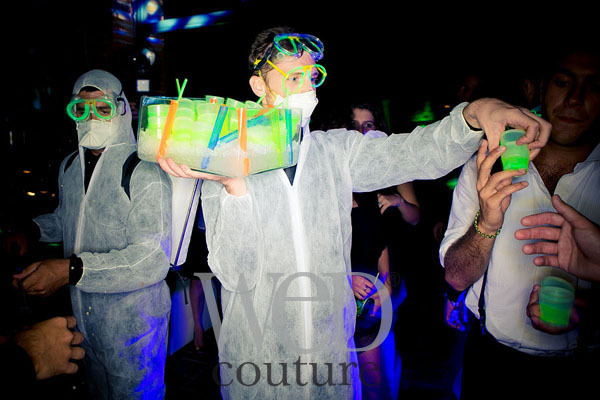 They had nothing but praise for our work which has immediatly become one of the signature WED Couture parties. It was a satisfaction beyond all means to be able to create this marvelous party for Alice. So if you are looking to celebrate your birthday party in Italy, why don’t we have a chat about it?